A couple of weeks ago, we jokingly called the Apple iPad Air 3 the Apple iPad Pro mini. That's because the new tablet is expected to have specs similar to the Apple iPad Pro, but with a smaller footprint. But a report that was published today says that the next 9.7-inch iPad will be merely another variation of the iPad Pro. 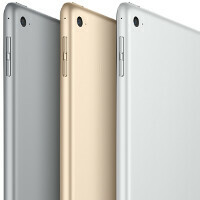 That means that Apple will have a 12.9-inch version of its top-of-the line tablet, and a 9.7-inch variant. Whether by coincidence or design, the 9.7-inch iPad Pro is expected to be unveiled at the same March 15th event that will see Apple make official the 4-inch Apple iPhone 5se. And while the iPhone 5se and the Apple iPhone 6s are believed to share many of the same specs, the same is expected to be true for the two iPad Pro variants. Both will be powered by the Apple A9X SoC, carry quad-speakers, and contain 4GB of RAM. In addition, the 9.7-inch iPad Pro will also support the Apple Pencil like its big brother does. And using the magnet-based Smart Connector, Apple will offer a smaller version of the Smart Keyboard for the newer tablet. The 9.7-inch iPad Pro will be available in the same color options as the larger model (Silver, Gold and Space Gray). It also will be available in Wi-Fi (32GB and 128GB) and Wi-Fi+ Cellular (128GB) just like the 12.9-inch iPad Pro. The pricing of the new iPad is said to be closer to what an iPad Air 3 would have cost, as opposed to being priced in the $799-$1079 range of the larger iPad Pro. This is what the iPad Pro should have been. A 9.7 inch iPad with top notch specs not a 12.9 inch monstrosity. When you start reaching that screen size, a mobile OS doesn't suit it anymore. I disagree, I love to draw and in my opinion the iPad pro is made for designers - the screen is the size of a regular paper, so you are sort of drawing full scale - I loved that about iPad pro. I would own one, but my iPad 3 still going strong, and I already have pens - when this thing breaks, I'm defensively going for the pro+the pencil. I love the s-pen on note 4/5, but the pencil is such a better drawing tool. After playing with it - I want it bad. That's going with the assumption the iPad Pro is made for one thing and one thing only, drawing. When used for other productivity inclined tools, it pales in comparison to the surface for example. All that screen real estate can be put to better use than just drawing surely. And I doubt Apple had it in mind to target such a small demographic of the population. So why not make it an actual PROductivity device? Can't disagree with that. I was just noting my speculation on why the pro was made that size. Yes it can be used for all kinds of other productivity - just like the other iPads, but I loved the full page screen size - that what stood or for me. I wish I would have known they were releasing the Air 3 so soon after the holidays because I would have waited for it. Oh well, see you in another 3 years or so. It will be a pro alright! Other than the extra horsepower and Apple Pencil, it's just an iPad and I'm quite okay with that. This variant would be the same price as all the other 9.7 inch iPads. More like $499-$549. $699 was the starting price of the 128gb Air 2, even apple wouldn't change up their 9.7in iPad prices so drastically. then i guess the $800 repeat of last years s6 that only bought back sd and dust proof features previously released are your take! I'm sure I saw the same comment on macrumors. Desperate for likes huh? Have you read? 32GB and 128GB model on the sentence part? You need glasses cause your not even reading it right. I don't think he read the article. Just read the title, and jumped right into the comment section. Why? So 75% of the things you use an be programs that aren't touch optimized? Even amid "falling" sales, the iPad has still sold more in its worst quarter than all Surfaces over all quarters. The 9.7in does not nedd a full blown os. I would agree that the iPad pro does though, I think it would sell more if it had OS X and it would be real competition to the surface. The iPad Pro is out selling the Surface Pro though. I'm talking about the iPad Pro by itself. Look it up! I know it's outselling the surface, but they are in two different categories. The surface may be in a tablet form factor but it is a laptop. The surface can do way more than the iPad pro because it runs W10. When I said an iPad pro with OS X would be real competition for the surface, I didn't mean, in sells but in terms of what you can do on the device. But can it compete against ipad pro's mobile appstore contents? I know surface cause it has a lot more softwares. But still requires a setup to do everything. And setting it up on the windows menu. Especially If its an apps which isn't part of steam, ubisoft, ea, origin, blizzard, or any game studio publisher but an indie games. Also, you would need a keyboard and a mouse to make it run properly. Well of course Apple's app store is way better than windows app store, I have no objections lol. I really hope it doesn't have the same resolution as the iPad pro. I want a Pro so bad, just can't justify it right now. Dj I know what u mean, I love the pencil and the way it just works on the screen. Freaken couldn't stop drawing in the Apple Store. When they come out with 3D Touch for the iPad Pro, I'm totally getting one. If the Surface doesn't have it by then. I got my hands on this iPhone 6s Plus, and 3-D touch would be perfect on the tablet, it gives you a way to right-click, so far my biggest pet peeve with using the surface Pro.